Meta Helen Land, known as Helen, was born on February 14, 1910 in the town of Smithtown, village of Hauppague, the daughter of Percy A. Land, age 24, carpenter, and Meta Petermann, age 24, born in Hoboken, New Jersey, she was the second of two living children. Attending physician, Roland Hazler (?). Percy is listed on the birth certificate as being born in Hauppague, this is obviously in error. Among the papers that Helen gave me were several copies of the following article from the Smithtown Messenger, May 25, 1923. "Quite the daintiest play we have ever seen, and the nicest play on the Smithtown stage, was given last Saturday evening by an energetic and fearless tribe of clear voiced and bright eyed youngsters, in Assembly Hall for the benefit of the library. The play started with a prologue which was fetchingly recited by Lillian Dvorak, and airy Fairy Lillian she was in truth. Cinderella, the Daisy was excellently played by Irma Norton Conn. The Proud Sisters, Hollyhock and Tiger Lilly, were certainly fine, and real spitfires, (but only on the stage, we hope.) Ruth Purick, as the Fairy Godmother, played her part with dignity, while Phyllis Deutzmann, as the Bonnie Bee, serving as a little page to Cinderella Daisy, proved to a very busy bee, indeed and seemed to rouse the risibles of the house, which only added to her own enjoyment. The Butterflies, Eva and Edith Schecter, were true, flitterers, and kept going from flower in truly proper way, and did well, Robin Red, the Prince's Herald, or Helen Land, made up splendidly, and was very clear in her diction and expressive in her playing, while Ruth Crane, as a really and truly Prince, with a great wavy plume and picture hat, and Hessian boots, that went flippity flop in truly romantic style, made a wonderfully pretty Prince. She sung well and spoke clearly. All the little flowers who were the guests in the ball, Evelyn Lawrence as the Poppy, May Moseley as the Pansy, Grace Courier as the Daffodil, Marjorie Deutzmann as the Violet, Margaret Simonton, as the Tulip, Elva Jones as Lily Bell, Muriel Ludder as Sweet Pea, Lois Gould as Narcissus, Margaret Richards, Isabel Lawrence, Vivian Swensson and Clara Jones as Sunbeams, and Florence Valentine, Thelma Anderson, Florence Reynolds, and Lillian Dvorak as Raindrops, made pretty pictures, did their parts well and the singing throughout was well timed and enunciated. Much credit is also due to the accompanists, Miss Louise Martinson at the piano, and Mr. P. Kappardaki, violin. A recitation by Miss Mabel Hallock was well received and very well delivered. Harry Martinson rendered a very blase and cynical recitation to music a good theatrical patter. It was a play that gave pleasure to all. Among the people mentioned in the article were two of Helen's cousins, May Moseley and Grace Courier, and two of her long time friends, Lois Gould and Ruth Crane. 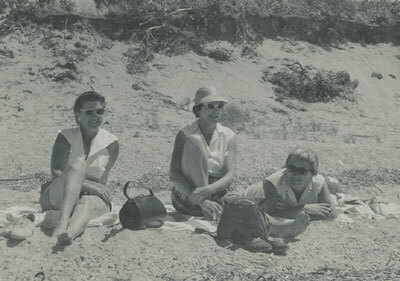 Helen's photo album contains photos of her years at Syracuse. There were no photos labeled 1932 or 1933. Photos labeled 1934 include group shots of sorority sisters from Alpha Gamma Delta and Helen's room at Alpha Gamma Delta. 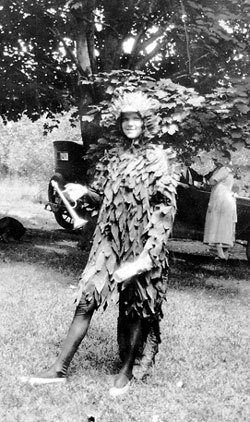 Helen graduated from Syracuse University in June 1934. "Mr. and Mrs. Percy Land, Allen Land and Mr. and Mrs. Clarence Land motored to Syracuse this week to attend the commencement exercises of Miss Helen Land, who graduated for the College of Library Science." Not long after her graduation Helen was in St Luke's Hospital in NYC where she had an appendectomy (The Long Islander, July 6, 1934). After college Helen worked in Riverhead for a few years. There are several photos of Helen with co-workers dated 1936 and 1938. She worked as a librarian the Locust Valley Library for 35 years until her retirement in 1972. I was told that I was named Marguerite Helene after my father's mother and sister. My father's mother was called, Meta, and his sister was called, Helen. In fact neither my grandmother nor my aunt was actually named Marguerite. Perhaps it was the name affinity (or actual lack thereof) that initially made me feel a special bond with Helen. Helen never married. She lived with Meta in Smithtown, Long Island. We lived in New Jersey and went to visit at Christmas and in the summer. Consequently, as a child, I did not see Helen often. But when I did I was very taken with her. She had a certain air of mystery about her. She smoked unfiltered Pall Malls with absolute elegance and blew the most consistently perfect smoke rings. Despite the availability of a larger room in the house she remained in the small bedroom of her childhood. A visit to her bedroom was a treat. She would let me rummage around in her jewelry box. I was not allowed to wind the music box it contained but we would sit and watch the ballerina whirl after Helen had set it going. I was also very intrigued and a little jealous that her mirror and dressing table were filled with photos of children I did not know. Pictures of my cousins and siblings were all around the rest of the house but Helen's room was the special province of these strangers to my life who were clearly competition for a place in Helen's heart. I was most intrigued by Helen's ability to read very fast. 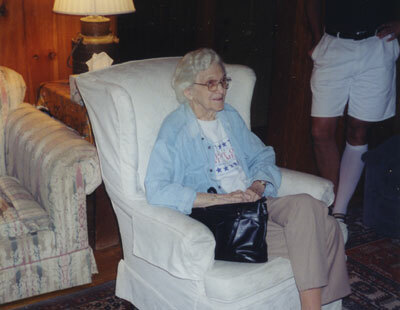 Helen was the librarian in Locust Valley, Long Island for 35 years. She would come home from work in the evening with several books. The next morning she would leave with the same books. When I asked her why she bothered to carry them home when she obviously didn't have time to read them in one night she told me that she skimmed them so she would be able to tell the clients of the library what they were about. She then showed me how she would speed read the books (years before Evelyn Woods). It's a trick I have still retained to some degree. Once she came home with four books and left the next morning with three. When I suggested that she didn't have enough time to read them all even with her special fast method she told me that it was an exceptional book that she really wanted to spend more time with and enjoy fully. As I got older, I became (as many of the young do) involved with my own life and did not go on the family trips to the Island. For many years I only went to visit a handful of times. Occasionally I would see Helen at my parents in New Jersey or at some family function. It was always a treat to cuddle up next to her for a long chat. Years later, after my father, Bud, had a stroke, we started taking him out to the Island in the summer for the Smithtown High School Reunions. 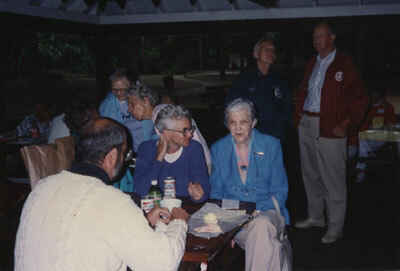 These "reunions" were held in a pavilion at Long Beach and everyone who graduated during a 25-year period was welcome. This included Helen and some of my mother's siblings and their spouses so I made contact with a lot of people I hadn't seem in a long time. We would usually stay on the Island for a few days so part of the trip always included additional visits to Helen. We would look at the family photo albums and my dad and Helen would reminisce about the family and the old days in Smithtown. Then Helen moved upstate to live with her niece, Jean, in Inlet and I did not see her for five years. By the time she returned to Long Island to live with Ruth Ann (the daughter of her good friend, Ruth Crane O'Berry) my dad had died. In the meantime I had moved to Brooklyn and, having reconnected with folks on the Island, was going out there fairly frequently. St James was an easy and pleasant trip on the train. A short walk to Ruth Ann's house brought me to Helen. I was also by then interested in genealogy. Helen had done some work on the Land family a few years before. She provided me with some very important keys: where the family came from in England, where they were in Canada, the Sykes relatives in Toronto and the Land relatives in Philadelphia. Over time she entrusted me with the family photo albums and her genealogy notes. One of the last and best presents she gave me was the jewelry box with the twirling ballerina. Eventually I also became friends with one of the unknown children from the photos in Helen's room. They were, of course, the children of her dear friend, Ruth Crane O'Berry. Helen loved Ruth's daughter, Ruth Ann, like the daughter she herself never had. She was also extremely fond of Ruth Ann's husband, Raymond, who could really make her laugh like a young schoolgirl. Helen was like family to Ruth Ann and Raymond. When she was in her late eighties the wheels of her mind were slipping a bit here and there but for the most part she was still sharper than a lot of people her age. She loved to go to the Three Village Inn in Stony Brook and she loved my Uncle Charlie Edgar. Charlie was married to my mother's sister, Peggie. Once Tom and I invited Helen, Charlie and Peggie to lunch at the Three Village Inn. Charlie and Peggie went in their own car. Tom and I picked Helen up at Ruth Ann's house. Helen had a note written by Ruth Ann telling her the time we were picking her up and mentioning that Charlie and Peggie were joining us. She got in our car as if she knew us but when we were almost in Stony Brook Helen asked, "Who are you two anyway?" We explained who we were but she kept waving her note and saying, "It says here I'm supposed to be having lunch with Charlie Edgar." We arrived at the restaurant and were about to go in just as Charlie and Peggie pulled up. The minute she saw him she exclaimed "I knew it was Charlie Edgar I was going to have lunch with." Later during lunch she clearly knew who Tom and I were. She called Tom "the famous doctor who takes Maggie all around the world" and she remembered the names of all our kids: pretty amazing! She took a dramatic mental downturn when she got sick the Christmas before she went into a nursing home. She became very disoriented and fearful. She rebounded slightly for a few months and then started slipping more and more. From the onset of that illness she did not know who I was and often called me a "nice young man". Some times, to please me, she would say, "Of course I know Maggie", but I really don't think she did. She thought Ruth Ann was her mother, Ruth. She often greeted Ruth Ann with a huge smile and a "Hi Ruthie". The interesting thing was that for a very long time she knew the people in the old photos I had enlarged to 8x10's. She really loved to look at them. Every time she saw a picture of Teddy Weidenkeller she would laugh and say exactly the same thing, "There's Teddy Weidenkeller, that little rascal." She appeared to be able to remember things up to about 1939 and could identify anyone in the photographs as long as they had entered her life before that time (regardless of how old they were in the picture). For instance she always knew her mother even in photos taken very late in life. She rarely, if ever, could identify my mother who married my father in 1942. Eventually even the recognition of the photos went and she actually became quite agitated when looking at them. She did like to listen to music and she was a good sport about going to the events that the nursing home had particularly if there was music involved, which there often was. She loved plush animals and played with them as a child would. While her condition, particularly mental, was much diminished, her demeanor was such that much of the time she appeared to be at some sort of social event in the late 30s (perhaps the happiest times of her life). She liked to drink coke and, not infrequently, referred to it as something stronger. She almost always had a smile for anyone that walked in the door and smiled at her. The aides liked to duck into her room and chat with her (perhaps to get some relieve from some of the other patients who were not a congenial). There were, of course, off days when she was not so convivial but for a long time she could be turned around with some good cheer. While spending one's last years in a mentally diminished capacity in a nursing home is sad in and of itself, Helen, adapted better than many people. Adaptability was a trait she had perhaps mastered many years before. Some have called Helen "shy" and she was quiet at home. Others knew her differently. Charlie Edgar who knew her since his youth says that Helen was "quite the party girl". 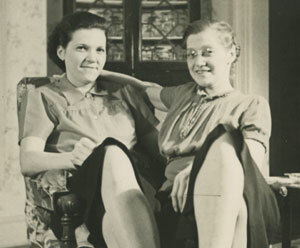 Helen and her life long friend, Ruth Crane O'Berry, were friends with Pop Edgar and his second wife, Maida Edgar. Pop Edgar was Charlie Edgar's father. 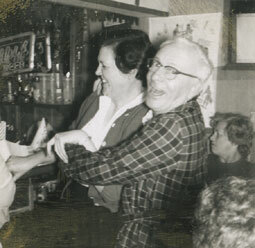 Pop and Maida Edgar were quite the party givers. They were big into theme parties: "Come as a bum", "Come as you are", "Come as your favorite song". 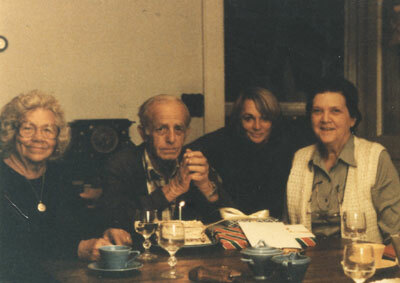 Pop and Maida were also amateur filmmakers and many of their parties were filmed. I have watched some of these old films (now on video) with Helen at Charlie and Peggie's house. I can't tell you how much pleasure Helen got from those videos. The parties were very lively and looked like lots of fun. Helen does not appear at all the "wall flower" in any of them. In the late 1930s or early 40s Pop Edgar's brother, Alec Edgar, was a widower with several children. As told to me by in parts by Helen, Ruth Ann, and Charlie, Alec Edgar and Helen had a relationship that ended in a proposal of marriage. Supposedly, Helen's father, Percy, did not approve because he thought Alec "too fast". Alec apparently liked fast cars and fast boats (not necessarily fast women). Perhaps Percy didn't approve of the partying that the group so clearly enjoyed, or the fact that he was 10 years older than Helen. For whatever reasons Helen choose to capitulate to her father's wishes and did not marry Alec Edgar. Several years later he remarried. Helen carried a picture of herself sitting on Alec Edgar's lap until at least the fall before she went into the nursing home, which was the last time I saw it. She continued her friendships with Ruth Crane O'Berry and Maida and Pop Edgar for most of her adult life. Come on Helen where's the BEER! Charlie gave me the above picture of Maida Edgar, Helen, and Dickie Land dated July 1960 with "Come on Helen where's the BEER!" written on the back. All the years Helen "went over to Ruth O'Berry's house" were, I believe, a euphemism for a wider circle of friends that she preferred not to talk about at home. Alec Edgar's first marriage was to Ruth Carnes O'Berry's sister, Maude Crane. Helen M. Land, a lifelong resident of the Smithtown and St. James area, died at St James Plaza Nursing Facility on Sunday, February 6. She was born February 14, 1910, the daughter of the late Percy and Meta Land of Smithtown. Helen was a graduate of Smithtown Branch High School and Syracuse University School of Library Science and was a librarian for 35 years at the Locust Valley Public Library prior to her retirement in 1972. Her brothers, Arnold Land, Allan Land and Edgar "Bud" Land, as well as their wives, preceded her in death. Former Smithtown residents, her nieces, Jean Land Bird and Joan land Davi and nephew Bruce Land as well as many other nieces and nephews and their children living in various parts of the country survive her. Cremation was private. A memorial service is being planned for later this year. Arrangements were handled by Hawkins and Davis Funeral Home. Among the papers that Helen Land gave me was a folder marked "Genology". In the folder were several sheets of paper on which Helen had made notes. Some of the information in the notes is a repetition of information listed under Law and Elizabeth and their individual children. I am including below only excerpts that contain new information. I have divided the papers into four sets depending on the type of paper and the focus of the information. The following information is taken from seven lined sheets of 8 by 10 paper white paper. The first four pages of notes were written in blue ball point pen. The last three were written in black ball point pen. There are corrections and additions to the notes in blue or black ball point pen, red pencil, and pencil.
" Started working on this in 1983"
Excerpts from the first page of Helen's notes. "Law Land had a sister Polly (Mrs John Wooler) lived in Wessahicken, Pennsylvania (near Philadelphia) died at age 73, September 21, 1944. She and two granddaughters, Elizabeth and Barbara visited Smithtown in 1942." "According to my father (Percy) his father said there was only one strain of Lands in England. Charles Lindbergh's mother was a Land and one of their sons is named Land L."
According to a recent biography of Charles Lindberg, his mothers family, the Lands, had been in America since the Revolutionary War, 110 years before our branch of Lands arrived in America.
" She also had brothers and sisters in Toronto, Canada and England. I have old letters written to Percy and Meta with names, places and dates, Bristol, Eng. and Batley, Yorkshire, place named would identify part of Eng the families came from". "An obit for Walter Sykes (died in 1937, 77 years old came to Toronto in 1885) Grandma Land's brother, Percy's uncle." I don't know what happened to these old letters and the "obit". When I asked Helen at one point if she had any old letters that would help in researching the family she told me she didn't . 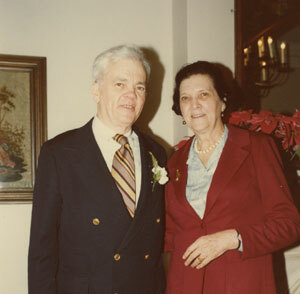 "Law and Elizabeth came to Toronto in 1882, moved to Detroit, Michigan in 1891: Percy 6 years old, to NYC, Hoboken, N.J. and moved to Hauppague in 1895, apparently lived both in Hoboken and Hauppague as Jo + Norman were born in Hoboken." "From write up in biographical volume of 5v set of Boroughs of Brooklyn, Queens, Nassau and Suffolk, L.I." The second page contains information on the children of Law and Elizabeth. This information relates to dates of birth, spouses, and dates of death and burial places. All this information has been included under each individual's page. The third page lists the children of Clarence Land and Victoria Grace. This information has been included in Clarence's page. Page four contains information about the Grace family. "Started working on this in 1983 after request from Janet Clark Land Shaw at "Last Prom" in 1983 at New York Ave School." Muriel married Wilfred Phillips have one son, Arthur, 2 grand children. 2 sons, Flloyd + ? Roger? In Messenger May 12, 1950- A column "Through the Years"
24 yrs ago "Local relations received word that a son, David, was born May 11 to Mr and Mrs Frank Marlborough at their Brooklyn home. During the summer they live on Maple Ave."
See Clarence for information on the Grace Family. Page five contains another listing of Law, Elizabeth, and their children's dates of birth, and death. Again, this is listed under each individual's page. Page six contains another list of the children of Clarence Land and Victoria Grace. Page seven contains a listing of Percy Land and Meta Petermann and their dates, three of their children, Percy Arnold, Jr, Helen, and Allen, their dates, and the dates of the children of Percy and Allen. All this information is listed under each individual's page. Helen did note on this page that Meta Petermann was baptized under the name Marguerita Helena. I was alway told that I was named for Meta. However, Helen's notes contain the only indication that her name was Marguerite. All the records I have found list her as "Meta". The following information was taken from two sheets of yellow lined legal size paper. The first page was originally written in blue ball point pen with corrections in pencil. The second page was written in pencil. "was a cabinetmaker by trade"
"came to Toronto Canada around 1882; Detroit Michigan 1890: to N.Y.C. ; to Hoboken, N.J.; to Hauppague about 1895"
"permanent position with Central Islip State Hospital October 1911"
+ Barbara Wooler visited in Smithtown in 1942. The next section includes the names and dates of the children of Law and Elizabeth. "To locate area in England from letters + clippings sent to Meta + Percy from relatives in Toronto. Walter Sykes born in Bristol Eng 1859 (brother of Grandma Land) died 1937 (77 years old) married Annie in Batley, Yorkshire, Eng came to Toronto in 1885 Annie died October 26, 1945 (age 89) was last of her generation in Canada and none of immediate Sykes family in England either- Many of younger generation still in Batley, Eng." " 1930 Golden Wedding Anniv. 2 daughters, 4 sons, 7 grandchildren to Toronto in 1885"
These notes refer to Robert Walker Sykes born circa 1859 in the village of Adwalton, Parish of Birstall, County of Yorkshire, England, who married Anne Hepworth in England and immigrated to Canada, circa 1883, and was listed in the 1891 census in Toronto, see Sykes. The second page written on yellow legal paper is dated 2/86. This page is a list of years starting in 1858 (the year of Law Land's birth) and ending in 1926 (the year of Law Land's death). Next to several of the years Helen made entries in what I believe was an effort to try and structure Law's life. Most of the years have nothing written next to them. Where there are entires, they give the birth of Law's children with the following exceptions. "1906 Jun 23, 1906 E. J. River"
"1908 Central Islip State in Aug."
There is no indication where she got this information. I do not know what E.J. River means. CISH stands for Central Islip State Hospital. This page also has a notation that the death certificate of Law Land is "in genelogy (sic) folder 2/86". The death certificate was not in the folder when I got it. Two sheets of yellow legal paper written in pencil, no date. The paper is colored with age. The first sheet deals with Elizabeth Sykes and her siblings, Robert and Samuel. A list of the children of Elizabeth Sykes Land. Does no include any additional information. Isabell-has children Isabell Counter buried her husband letter from Aunt Ann 1938. Page two is a piece of yellow legal paper folded in half. "m. Margaret (illegible word) in Belgan Congo in 1935"
"see letter 4-3-31 from Jenkinson, letter from Aunt Annie"
visit Sm in 1930 ? The only paper in set three is a questionnaire written in black ball point on one sheet of paper and answered by Helen in a variety of inks. To differentiate between the question and Helen's replies, I have written the questions in black and Helen's replies in blue. The first part of the questionnaire deals with the Petermann family and is the only information in the Genealogy folder that addresses the Peterman genealogy. "Does the inscription in the wedding ring Arnold has give the year they were married?" " Jean asked for info 11/11/91"
Mother's maiden name: "Sophia Mary Steuer"
Where in Germany did they come from. "John Bernhard (Barny) b. Oldenburg, Germany died 1909. Sophia Mary Steuer b Elsfleth, Germany died about 1900." How many children + their names. Helen answered the last question on the bottom of the page. John Bernhard same name as deceased baby died 1963 (80 yrs old) born 1883? Flower Hill Cemetery, North Bergen, N.J.
Where was your father born? June 8, 1885 Toronto, Can. When did the move to Detroit and when did they go? to N.Y.C. when? To Hauppague when? A listing, on a small piece of white unlined paper, with information taken from the death certificates of Law Land and Elizabeth Sykes. A newspaper obit about Barbara Herrmann, age 99, born in Hoboken and died in St James in 1990 in which the Hoboken fire of 1900 was mentioned. Notes that Helen made comparing the dates of Barbara Herrmann and Meta Petermann Land. A draft of a letter that Helen was writing to Bud Land. "Thought you might be interested in this item I clipped from the Newspaper. I read it with much interest as I recall Mom telling me about her father being the last one getting his crew off safely to get off the dock alive. I called Ellen Herrmann, the daughter-in-law who gave the story to the news reporter and briefly told her our grandfather's part in the fire and that my mother was born and grew up in Hoboken. She was born in 1891 and Mom in 1886 wonder if the knew each other. She said her mother-in-law had many stories about Hoboken- one that the paper didn't print was about her being on Kaiser Wilhelm's yacht. I have a picture of my mother and another young lady on the deck of a boat with 2 uniformed male cousins who were on the crew and I think Mom said it was Kaiser Wilhelm's boat. Do you have this picture? Jimmy and Marion are the proud parents of Clayton Allen Land 9 lbs 15 ozs born July 27"
"On family group picture Mrs Herrmann housekeeper and (two illegible words)"
Sometime in the late 1980s or early 1990s when my father, Bud Land, and I visited Helen in St James she showed us the picture of Meta et al on the boat. It was not, however, among the photo Helen gave me. Three small pieces of white paper with notes written in blue pen and pencil . "P6 after Grandma died the North Country Rd property was sold to a developer and the money divided 4 ways. Check my record for 1973 any entry of my 40,000"
"This was buying and selling stocks through Prudential Bank. This info not given to Joan"
Law Land came from England to Toronto Canada in 1864 with his wife Elizabeth Sykes and infant son, Clarence born in England. Law's sister Aunt Polly lived in Pennsylvania gave Joan her address"
The third sheet of paper relates entirely to photos that Helen sent to Libby Land Fairchild. Thought you would like to have this one Grandma and Joey. I took this one at our home in Smithtown sometime in 1926. After Grandpa died Feb 26, 1926. I don't know when Joey was born. You may be able to tell how old he was. This is your doing your famous split. I took it in June 1926 when your mom chaperoned my "friendly club" gang at "Tumble Inn" (Gould's camp at Fort Salengo in the L.I. Sound). The gal is Ella Mullin one of our gang who lived in Smithtown at the time. Her older sister, Mary, married Bernard Olivie--- You probably don't remember them. I can't reconcile dates for pictures 2 +3. Uncle Normans wedding day January 4, 1921. I had duplicate of this so am sending one to you.